Revamping a website is a lot like birthing a baby. The newly redesigned Winship Cancer Institute website [winshipcancer.emory.edu] has been nine months in the making and has taken a lot of patience, perseverance and careful handling. Now that our web team has completed the project, we're ready to show it off. Patients matter most. 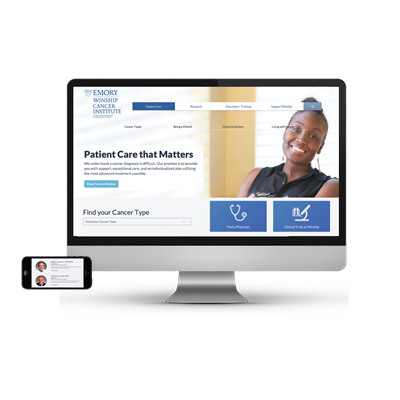 We designed the new website with our patients in mind. Information is easy to find and easy to read starting with the home page. Careful attention has been given to areas that matter most to patients from cancer diagnosis and treatment to where to park when arriving for an appointment. Mobile friendly. Are you using a smart phone or tablet to search for a Winship doctor or directions to our four locations? We've made our website compatible for your busy lifestyle. You can see and read content clearly and legibly on any device. You can also call us using the telephone link at the top of the page. Clinical trials from A-Z. If you are thinking about joining the nearly 800 patients currently enrolled in clinical trials at Winship, the website will provide helpful information. Groundbreaking research. From bench to bedside, Winship investigators are at the cutting edge of the latest cancer research that is being translated into patient care. Did you know that Winship has led or participated in clinical trials of 75% of FDA-approved cancer treatments? Learn about us. From our doctors to our nurse navigators to our patients, the new Winship website weaves a story about how we have been growing hope in the state of Georgia and throughout the Southeast for more than seven decades.